October and November are busy, stressful months for me at The Day Job. So, when I do have down time to read, I look – more than ever – to escape real life and sink into a good book. Luckily, there’s Kathi Daley and the Zoe Donovan mysteries. The more I read, the more I enjoy the stories, the setting, and the series. In Haunted Hamlet, the ninth book of the Zoe Donovan mystery series, the town of Ashton Falls is once again getting ready for Zoe’s favorite holiday – Halloween. As the town dresses up in black and orange and residents shop for sweet or scary costumes, a 13-year-old mystery resurfaces after a suspicious death. As usual, there is more than meets the eye. Zoe and Zak are soon part of the unofficial investigation, piecing together bits of history and snippets of current events to reveal a dangerously deadly picture. Kathi Daley’s books are so fun and easy to enjoy. The combination of animals, pets, and wildlife provide a cozy supplement to the tightly knit human cast of characters; I often find myself wishing the adoptable animals were real! Though, if they were, I’m sure my own home would soon resemble Zoe and Zak’s! 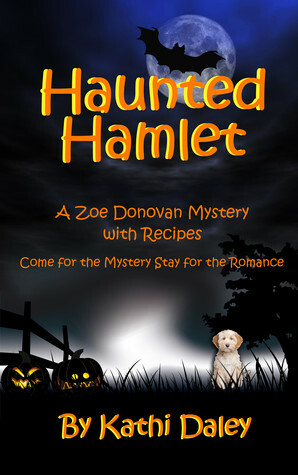 Haunted Hamlet is an engaging Halloween cozy – and the perfect escape-from-reality read.